Bertha Lewis: From ACORN To The Black Institute In this week's "Wisdom Watch" segment, host Michel Martin speaks with Bertha Lewis, former CEO of the Association for Community Organizations for Reform. Lewis discusses her lessons from the ACORN video scandal. She also shares the hopes of her new organization called The Black Institute and what it'll do that other think tanks will not do. In this week's "Wisdom Watch" segment, host Michel Martin speaks with Bertha Lewis, former CEO of the Association for Community Organizations for Reform. Lewis discusses her lessons from the ACORN video scandal. She also shares the hopes of her new organization called The Black Institute and what it'll do that other think tanks will not do. 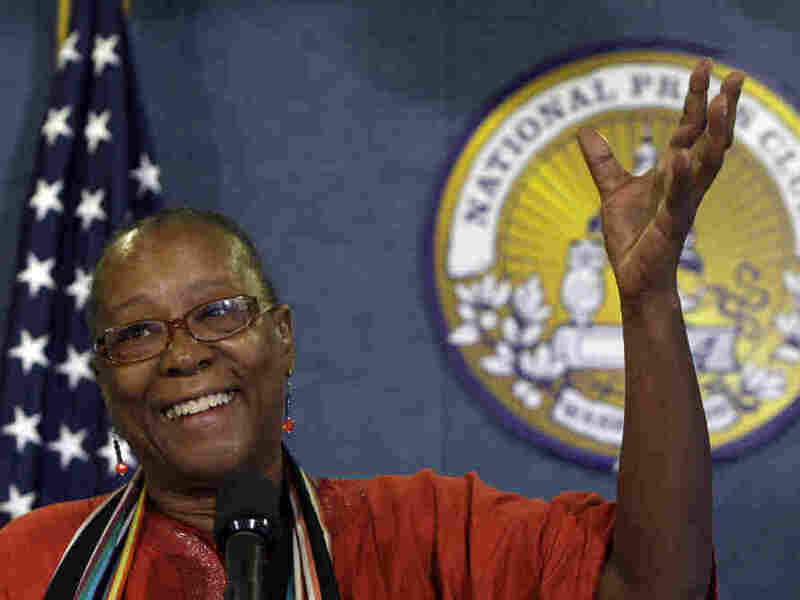 Bertha Lewis speaks at the National Press Club in Washington, Tuesday, Oct. 6, 2009. The New York Times Magazine – "Stinger: James O'Keefe's Greatest Hits"
Coming up I'll share some of my thoughts and my weekly Can I Just Tell You? commentary. But, first, you might have seen a recent profile of conservative activist James O'Keefe in the New York Times magazine. O'Keefe has won fame or infamy, depending on your point of view, by catching and videotaping people in organizations he dislikes in unguarded and embarrassing moments. He did this to several Planned Parenthood chapters and to a former executive at NPR earlier this year. But before all that there was ACORN, a once significant grassroots organizing network that was forced to shut its doors after the undercover sting videos, though heavily and misleadingly edited, resulted in a loss of funding and support that crippled the organization. Now the former head of ACORN, Bertha Lewis, has a new organization. It's called the Black Institute. And she's with us now to tell us more about it. Welcome. Thank you so much for joining us. BERTHA LEWIS: Well, thank you for having me, Michel. MARTIN: What is the Black Institute? What do you hope to do? LEWIS: Well, let me tell you. The Black Institute is an action tank - a think tank that takes action. We have one perspective and point of view and that is from the point of view of black people and people of color throughout the U.S. and diaspora. We have two goals: to actually inform public policy and debate, make sure that people of color and black people in this country are counted in their own data, research and polling, rather than being a tab in someone else's poll. Making sure that we are actually training folks. We have three strategies that is research, which is the data, the polling. We also will be doing leadership, which is training and leadership development. And then community. MARTIN: Well, what do you think your organization will do that existing think tanks - I know you're saying it's an action tank - will not do? For example, the Joint Center for Political and Economic Studies. Then there's, like, the Center for American Progress. MARTIN: And there are groups like that. What do you think you do - will do that these existing groups do not do? LEWIS: First of all, it's the wrong question because it doesn't have to - one is not an either/or situation. Those of us who are progressive, those of us who are on the left need to take a lesson from the right. No one think tank can do all of the research. We need a lot more. We need institutions all over. This is why I think the progressives and the left were so vulnerable to attack because we go, oh, we have one of those. Well, guess what? We need tens and hundreds of those. I want to add to the voices that are progressive. I want to focus on black folks. I want to focus on our sort of new diversity so that all of the sort of intellectual information and the background doesn't just stay stagnant. MARTIN: Tell me more about why you want to have a focus on the black folks per se, given that your previous work was in multiracial coalitions. In fact, ACORN was more about poverty. MARTIN: So it wasn't about race. It was more about low income than it was about race. LEWIS: Black folks. You know, black - I come from a generation where we had to just take that term and wrestle with it and redefine it for ourselves. But I do have to say, for me, coming out of the troubles from 2008 through 2010, it was a very profound experience. We talked a lot about how ACORN was the canary in the mine. We kept trying to tell folks there's a new sort of wave in town. You ought to be conscious of it, because if they come for us in the morning, they're going to come for you at night. And we did organize low and moderate income folks. It just so happens that over our 40 years, period of time, most of those folks - and the reality is - most of those folks that are poor and struggling - the working poor, are people of color. We are becoming, so they say, a majority/minority country. That is, we are going to be a majority black and brown country. And you know what? I'm sick and tired of black folks being sort of an appendage. What is good for black America is good for all of America. MARTIN: I want to pick up on something you just said that you feel that would happen with ACORN if ACORN was like the canary in the coal mine in the sense that what engulfed ACORN was something that other people were going to experience later on. It became true. We experienced it here at NPR. Everyone, I think, is aware of that story and led to the resignations of some top people here. But I want to talk about what you think happened there. For people who don't remember, some employees were caught in an undercover video appearing to advise a couple who were posing as a pimp and a prostitute on how to break several laws and avoid detection, recorded by conservative activist James O'Keefe. And I'll just play a short clip just to refresh people's memories about, you know, what happened here. UNIDENTIFIED MAN: So I can be the one who - I have the documentation, right? So I can be the one - basically put up the house for her and she can perform tricks in the house. MARTIN: All right. So there were several investigations, probes, by the California attorney general, by the Brooklyn, New York district attorney, including Congress. And it emerged that these videos were heavily edited, that no one had in fact broken the law, that people were not in fact facilitating prostitution, that in fact, and in fact in a number of instances that ACORN employees had called the authorities and had tried to alert the authorities to what they thought was going on. But even having said that, when you look back on it now, did your employees perhaps go too far to be understanding, to look as though that they were, you know, too tolerant? I mean the thing that makes people crazy is to say that, look, I mean, you know, why didn't you just throw the people out? MARTIN: So what was that about? MARTIN: No. No. What we hear on these tapes is him wanting to set up a house of prostitution. MARTIN: And so what you're saying is for those who heard those tapes, you're saying that he considered himself wanting to get clean? LEWIS: They were like, oh my god. Oh my god, they're just going along with this. LEWIS: And I'm going to repeat this again. LEWIS: Again, in video what you think you saw did not in fact happen. In audio what you think you hear did not in fact happen. Why would these district attorneys and folks investigating, they actually got the unedited tapes and they actually talked to these women and talked about the context, what was said, when did you say this, how did you say this? And so this is where the conclusion was that no laws were broken because in fact not only were nothing legal, illegal done, but morally what you didn't hear, and if ever we can get these unedited tapes, what you would see is our counselors actually sort of feeling sorry for these folks, saying that's really bad. MARTIN: There were some employees who were fired though. LEWIS: There were employees who were fired immediately and then reinstated. LEWIS: ...on folks, you know, we were all shocked. We were already under relentless attacks and trying to make sure that everything was - in our house was in order. And then for this to happen out of the blue, for me as the CEO at that time, my real concern was that I said, why didn't anybody tell anyone else that, hey, these two white people walked up in the office. LEWIS: Isn't that unusual? And in the end the counselors were like, we didn't think anything of it because there really wasn't much to it. They weren't there that long. LEWIS: Yeah. Sure. But when you make a mistake, you have to correct it. LEWIS: Let me just say, you know, organizing by any other name is still - can be still as effective. Poor people didn't go away. Black folks certainly didn't go away. And we were already in the process of reorganizing. You know, I had started to institute some reforms. We were making all of these improvements and we were this close to going for the next 40 years. What, you know, what's the new ACORN going to do and to be focused on? And so what some of the states did was they said, you know what? We're going to start over. We want to go deep locally. And so folks reorganized themselves, revamped themselves, created bullet-proof or state organizations because you learned that lesson. MARTIN: Nobody is called ACORN anymore? LEWIS: We became - it really was the Scarlet letter, the big A.
MARTIN: What do you think you've learned from all this? Because some look at this and say that the model perhaps is no longer relevant to today. What do you think it means? LEWIS: I think that's false. I don't know, you know, what people would be saying that. And I think the people that will be saying that are some of the same people who want poor people to go away. They want black people to go away. They want brown people to go away. They want the working poor to go away. We were attacked because we were effective. And we were attacked because we were the largest organization of poor people in this country and we had power and we actually made change. We worked on the minimum wage for 10 years. We built hundreds of thousands of units of housing. We attacked the privatization of education. And more importantly, our voter registration said to folks in public housing, and entrapped in ghettos, you still count and you can go to the polls to vote for a better wage or better living conditions. It was in between presidential elections, it was those local elections, those I think - those are the people that we pissed off the most. MARTIN: Why were you drawn to this particular work? MARTIN: ...any number - lawyer. It sounds like you argue a fair piece. LEWIS: ...and that had a message. And I thought through the arts that would be my social activism. But as fate would have it, I moved into a building with some other artists way up in the South Bronx. We got duped into it, had to organically form a tenants association. I became a tenant leader fighting for my home, didn't know anything about it. I left the theater one day and never went back, and it changed my life. This was important to me. And in a way, you know, we could make plans but the creator has something else in mind. And so I think I wound up where I should've been. I certainly wound up in the eye of history. I wouldn't have changed the last couple of years of this right-wing attack for anything. LEWIS: It crystallized things for me. And it crystallized for me that as I move forward, yes, I want to talk about race in particular because I've fought for poor people and low and moderate income people during my 20-some years at ACORN. However, I think people of color, across the board, it is not just poor people that need to be organized. I want to organize and really live the fact that race matters. MARTIN: Bertha Lewis is the former president and CEO of ACORN. That's the nationwide community organizing group. She is now the CEO and founder of a new institute called The Black Institute and she was kind enough to stop by our Washington, D.C. studios. Bertha Lewis, thank you so much for joining us.